The third week of April is meant to be designated to organizing your files. This might give you a bit of incentive to finally dig into all of the paperwork that has been piling up over the years. Of course, you should also jump into organizing your files on your computer too. This might seem like a task that will leave you running for the hills. Organizing doesn’t have to be a burdensome task though. You might even find something therapeutic in it. There are even a few ways to save some money on getting your files organized. These ten tips are bound to help you get through the mess for much less. A lot of the time, we are too afraid to actually shred documents, which can leave us drowning in papers. One of the key elements of organizing your files is to shred some of them. For instance, you won’t need to keep every bill that you come in contact with, especially if you’ve already paid it. Another thing that tends to pile up in the shred pile is credit card offers. These should be shredded quickly, so you can simply move on with life. You might also find yourself holding onto notes, cards and other items. If they don’t have a significant value to them then you might want to give them the boot. Shredding large quantities of papers is bound to be time consuming, but when you’re finished with the project, you’ll feel so much better. You might even start shredding papers as you receive them to help ease the burden of organizing. While organizing your files, it is important to consider adding a digital backup of each important document. This task is actually much easier than it sounds, but it can be time consuming. If you have a scanner then you’re already set to start working. Simply scan your important items and add them to a form of digital storage like a USB drive, external hard drive or even a service like the Cloud. Scanning your files can help you avoid problems if you ever cannot find what you’re looking for. It will also offer a bit of reassurance when it comes to natural disasters. Some items that you should consider scanning are legal documents, such as your marriage certificate, and items like insurance policies, deeds and titles. This should help to avoid delays if you ever find yourself in need of these items. Another key to organizing is to know how long you should keep certain documents. A lot of the time, people will hold onto paperwork for their entire life, which can really take up a lot of space. You don’t have to hold onto anything that long apart from important documents like your social security number, birth certificate and so on. Luckily, there are many handy guides to help you figure out how long you should store your paperwork. Tax returns, for instance, should be kept for about seven to ten years. Once you figure out how long you need to hold onto items, you will probably find yourself shredding for some time. Your file cabinet will thank you for your hard work though. Filing cabinets aren’t the only thing that needs to be cleaned out. You should also take some time out of your day to take care of your storage on computers. This includes items like photos and videos of your family. When you go through these items, it is important to consider a secondary source of storage. Computers and other gadgets aren’t entirely reliable, so you never know when your information will go missing or a computer will crash. Luckily, there are lots of great items that you can use to store your information. An external hard drive for instance, offers a lot of extra storage and can be hooked to any computer. This will certainly help you feel better about your content. If you want even more protection, then you can also store your items on Google or the Cloud to ensure you have easy access on any computer or device you log into. Ensuring you have secondary storage will bring you peace of mind and will help keep everything organized as you can remove old files from your primary computer for good. A lot of people don’t want to get into organizing their files because it usually means spending some money on items to help you get organized. This can be a drain on the budget and often brings even more frustration to the project. There are actually many things you can make out of your recycling to ensure you have storage space for less. For instance, you might consider cutting an empty cereal box to use for paper storage. These containers can be customized to suit your needs while also saving you big money. There are so many storage ideas to work with too, so browse around online to see what works best for you and your needs. Another problem that many people face when it comes to storing their files is the containers they keep them in. Many people like to work with binders or cardboard storage containers, which won’t stand up to the tests of time. You run the chance of finding your files ruined by water or other spills. You might also find them littering the ground if you try to pick up the box or binder after a long period of time. Your best option, if you plan on sticking with a box container is to go with plastic. It will make your life easier if you choose a clear plastic too, as it will give you the chance to see what is inside without even opening it. Another option, especially if you want more security, is to pick a filing cabinet or safe for your items. Choosing the right cabinet can be hard but picking items that are fire proof and protected with a lock are probably going to be your best investment. Sometimes, organizing your files can be as simple as running a scan on your computer. If you have antivirus software, then you can easily run it to find out if you have unnecessary files. The programs will pick up on duplicates, things you no longer need and so much more. Best of all, all you have to do is click a button and the excess files will be deleted. If you’re looking to make more room to store files on your computer then you might ditch your temporary internet files and cookies in order to clear out what you’re looking for. This trick will take a huge burden off of you and will make the organization process fly by. When it comes to organizing, especially when you’re working with a filing cabinet, it is easy to find yourself lost in papers. Labels can be hard to find within the chaos, which might force you to want to steer clear of your paperwork entirely. Color coordinating your items can be one of the best ways to help you find precisely what you’re looking for in a room. You can easily add a touch of paint or marker to the files you already have, or you can simply buy folders that are already colored. When it comes to organizing files online, you can use special icons to help set them apart. This is bound to help you when you’re searching for things in a hurry. One of the key elements to taking care of your papers is to actually take care of them before they start to pile up. It is hard to take care of papers when they come to you, but if you form a routine then you’re certain to feel more confident about the process. Even if you don’t feel like shredding papers whenever they come to you, you can easily create a box for shred worthy papers, so they don’t wind up taking up space around the home. Another great way to prevent pile up is to go through your papers quarterly. This will allow you to speed up the organization process, so you don’t spend hours combing through papers. Another problem that many people face is the lack of functional storage. Often, we choose things that we think are suitable or we have grand ideas to upscale the home to suit the items. However, in most cases, it simply leads to clutter and discomfort. Even if you have big dreams for your home, you should shop for what is going to work for your life now. For instance, if you choose a filing cabinet that doubles as an end table, you won’t feel put out by your files. You might also choose a desk that allows for some storage, which is certain to make working easier anyway. If you choose to store items in containers then make sure they have a designated space, so they don’t take over your home or migrate from place to place. Whether it is Organize Your Files Week or you’re simply doing some spring cleaning, these tricks will help you make the most out of the experience. Before you know it, you’ll be all set so that organizing your home and computer files won’t take ages to do. 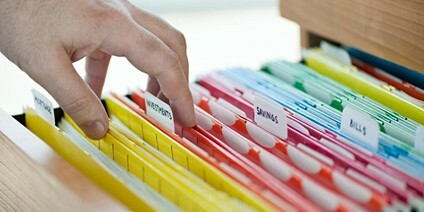 With any luck, it will help you find the routine you need to make file management a breeze.